Toronto is in the midst of an affordable housing crisis: we can’t afford to lose any of the affordable housing we already have. Rooming houses and their tenants must be protected! Do you want to help shape policy proposals to address the loss of Toronto’s rooming houses & dwelling rooms & improve conditions for rooming house tenants? Learn more about the Dwelling Room Preservation Policy Initiative and sign up to get involved! As real estate values across the city have climbed, the loss of rooming houses due to development has quickly escalated. People across the city are being forced from their homes and into homelessness to make way for housing for more affluent people. Last year, the Parkdale Neighbourhood Land Trust conducted research on rooming houses in Parkdale. 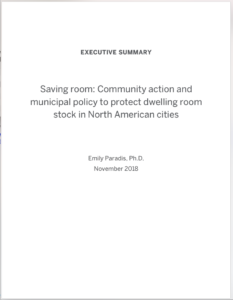 The Parkdale Rooming House Study confirmed an alarming trend that many of us are well aware of: the ongoing loss of rooming houses, with 28 rooming houses in Parkdale shut down over the past 10 years, resulting in 350 vulnerable people being evicted from their homes. The study found that there are 198 rooming houses left in Parkdale that offer affordable options for over 2,700 low-income tenants. These tenants are predominantly persons with disabilities, unattached individuals aged 45 to 64, and/or newcomers. However, the study determined that 59 of those rooming houses could soon be lost due to development, making over 800 rooming house tenants in Parkdale at high risk of becoming homeless. And that’s just in one Toronto neighbourhood.